For me, generating business isn't easy. I work in a relatively new field as a digital marketing strategist and start-up mentor - to be honest, I need all the help that I can get. My original intention for starting a blog was to increase my brand equity as an independent freelancer. Indeed, the greater your personal brand, the easier it is to attract and convert clients. Although my blog isn't the primary source for attracting new business, it plays an important part in helping me to convert clients. As is the case for most of us; the aesthetic look of my blog is paramount. I want a unique identity and a conducive mobile experience. Based on current digital marketing insights, mobile traffic has steadily been on the rise year after year. Comscore reported that this year mobile usage is at approx 50% of all internet traffic. As many of you know, this number is set to increase even further over the next few years. In practical terms, this meant I had to choose the simplest blog theme I could find. There has to be minimal friction and the reading experience has to be as visually engaging possible. I short-listed six mobile-friendly and minimalist templates from Creative Market and discussed the pros and cons with the team at Postach.io. Since mobile traffic is increasing, the blog layout has to render well on mobile websites. This means the main body text has to be easily readable without the need to "pinch and zoom". All meaningful links and calls to action have to to be present without distracting or annoying the user (other "fancy" website components such as pop-ups and sidebars etc have to be evaluated on a case by case basis to evaluate the effect on a mobile visitor). The Postach.io team gave me their thoughts in terms of the suitability to the blogging platform and also gave me a time estimate regards how long it would take to get the theme ready. From there it was easy enough to make a decision. Layout and aesthetic play a large part of a good reading experience, but nothing is as important as the font. I've often found that even the most functional and beautiful blog designs get everything right but the font. Why? A poor font choice can be distracting; it may hamper a person’s ability to immerse themselves in the content. For my own blog, the font I use is Palatino Linotype. For the purposes of blogging it is one of the most engaging and readable fonts I've ever seen. As you can see, the font has a rather elegant quality and is easy to read. It has a calm feel to it. Other fonts, can often be difficult to read and hamper the reading experience. 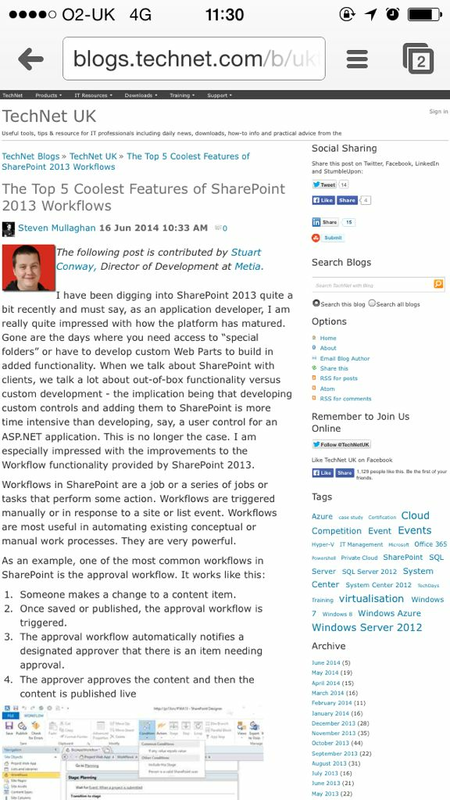 Take for example Microsoft's preferred font on it's tech blogs. They use Calibri, which on the face of it seems suitable to the task, but in reality -- and especially on mobile devices -- has an abysmal reading experience. So, I bought the font from a font marketplace and sent it to a UX/UI designer extra-odinaire. He was kind enough to customize the theme I bought from Creative Market, including my chosen font. He then made the theme available in my Postach.io dashboard. I then enabled Disqus comments by creating an account at Disqus and adding the ID to my Postach.io settings. Themes are made available in HTML/CSS format and often need to be tailored to give you a unique identity and away from the "cookie cutter" look. Since this customisation requires knowledge of html and css, if this is something you're not comfortable with, it's useful to hire a web developer to help you. It's not an expensive process and can save you weeks of grief. The result of my first sample post made me jubilant! The next thing I wanted to do was make sure I was able to collect analytics data. This was to collect insight so I could make further improvements to my blog based on visitor behaviour. To do this, I entered my Google Analytics ID directly into the Postach.io Dashboard. Google Analytics is great for general summaries of data, such as total number of visitors, average page time etc. But real-time analytics software such as Mixpanel allows behaviour tracking at a granular level. It is much better for analysing a customer journey (also referred to as a marketing funnel). 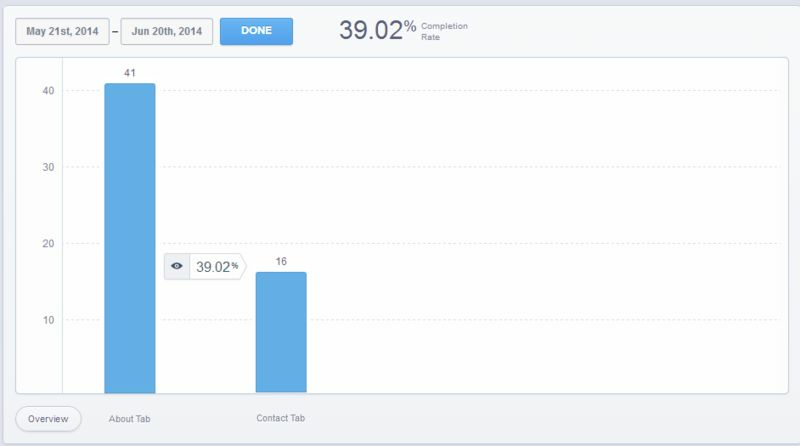 Here's a sample marketing funnel visualization that shows the percentage of people that read my bio that then went onto my contact page. With Mixpanel I can do some pretty nifty things: I can effectively track how often a particular button on my website was pressed, or see exactly my website failed on a visitor's journey through my site. This helps me gauge the effectiveness of the various elements of my site. While I didn't use the marketing funnel feature for this particular website (it's more useful on my main site), I highly recommend it if you have a particular visitor journey or a set of "call to actions" you want to analyze, such as a purchasing process. If you're worried about the technical nature of implementing analytics tracking on your site, you might prefer Heap Analytics. It has been designed from the ground-up for non-technical people. Regardless, the visualisation of data is a modern miracle every single one of us should experience. The first thing people often ask themselves after writing their first post is, "how do I get noticed?". I personally experimented with multiple ideas in order to answer this question. My Gmail address book was pretty large. I had built relationships with a large number of people for the past several years, and therefore had a large contact list to work with. I imported the email addresses from Gmail into Mailchimp and sent out my first blog post to the mailing list. I was aware of the possibility of a large number of unsubscribes on the first mail shot. Although I had 'permission' to contact these people, not everyone was likely interested in my blog. My first post went reasonably well - 200 unique visitors from my mailing list took the time to read my first post. 40%…not bad! Nowadays, I make sure that each time I write a post, I send it out on my mailing list. As I meet new people, I encourage them to subscribe to my mailing list and my readership grows. 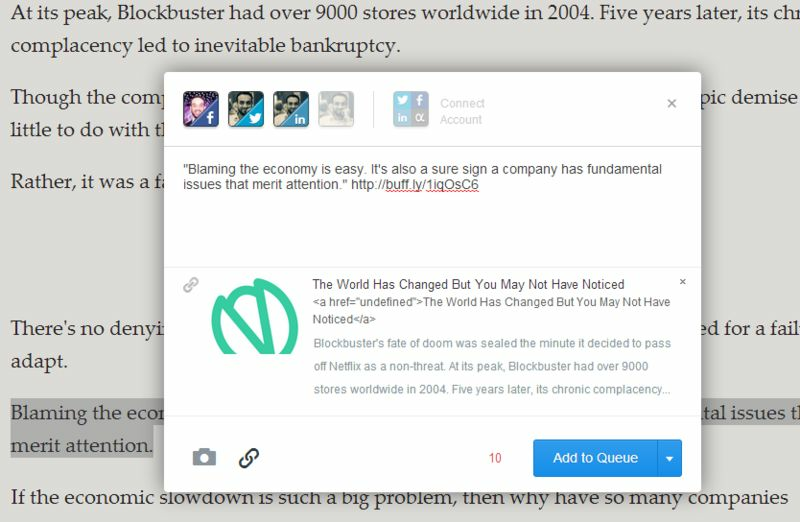 In addition to using Mailchimp, each time I wrote a post, I select key points from my post and add the content to my Buffer queue. By doing so, I can auto-post content of interest from my blog on all of my social profiles throughout the week. Bufferapp is great for scheduling tweets and status updates. For the tweets, I add relevant hashtags, since many brands and people often monitor hashtags. This makes it easier to ‘get noticed'. Occassionally I would also seek relevant sub-reddits on Reddit and other forums and publish my post there. This is often a 'hit or miss' strategy. Many sub-reddits have varying rules, and self promotion is generally frowned upon. Despite that, it can still work for some. One blog post of mine managed to get over 8000 visitors in the space of just a few hours. I did this by making a post to the /r/Entrepreneur sub-reddit. My blog post was about why teenagers are making a lot of money online these days. To be fair, I haven't been able to replicate the same results since (the moderators of the sub-reddit have since banned this sort of self-promotion), but hopefully it gives you an example or an idea of what can be achieved. Often you have to experiment with various strategies and see what sticks. I'd love to give you something more scientific or methodical than that, but the reality is, there's no sure fire way of pulling this off. Once I establish a modicum of traffic for each post, I analyse my traffic data both in Google Analytics and Mixpanel. Initially I suspected most of my audience would be from the U.K (my homeland). However, to my surprise, I found that a large chunk of my audience was from the USA and the Far East. This was a useful insight gained from Google Analytics. I then analyze visitor behaviour in Mixpanel. Often I find that a large percentage of visitors read multiple posts, and also visit my Twitter and LinkedIn profiles. Thus, I've come to the conclusion that new readers typically want to gain a better idea of what I "do" upon their first visit the site. This insight has helped me improve my prospecting process. I've also realised that I need to make it easier for them to get in touch with me. I was also lucky enough to get some qualitative data; more than 30% of my initial audience sends me written feedback! I use this feedback for each new post to make sure my blog is as useful and relevant as could be for my target audience. You see, trust is an important part of sales. It can only come from forming deep and meaningful relationships. In my field of work, most negotiations take more than one meeting. In between these meetings, I encourage many of my prospects to subscribe to my blog. This helps me form an ongoing relationship with my prospects throughout the prospecting process. This consequently helps 'tip' the clients over to a sale. I also track email analytics in Mailchimp, looking at 'click through' and opening rates. I experiment with various headlines, layouts and body content for the email blast everytime I write a new post in order to learn what works best. Over time, I have found that short body text and personalization gets a higher rate of click-throughs. -Make sure your theme is mobile-friendly and has an engaging reading experience with minimal friction. -Add analytics tracking to your site and use the insights to make improvements. -Encourage your prospects to read your blog to help improve the quality of your relationship with them. Then, wait for a phone call from Oprah. Reddit: The so-called "Frontpage of the Internet"